… and the giant clam, festively decorated for the Holidays. 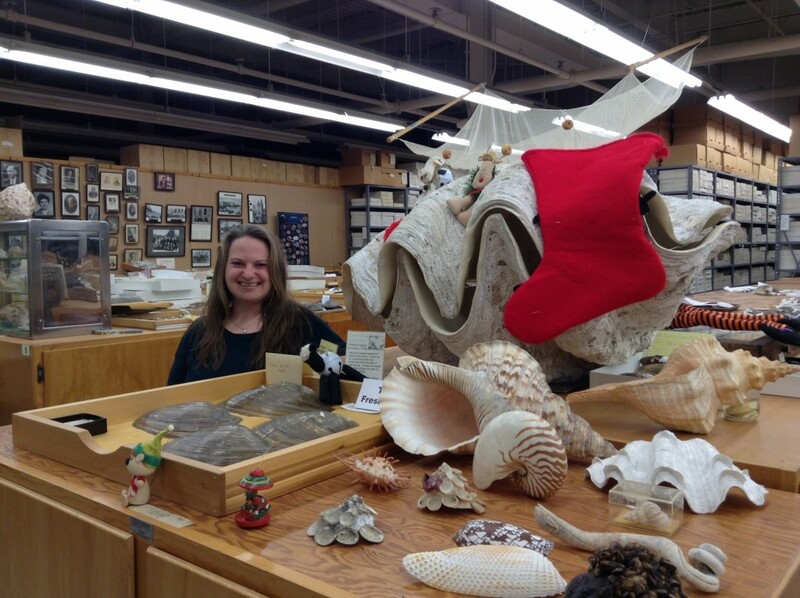 Below are a couple of photos from a quick visit to the mollusc collection. Note in the foreground in the picture on the left the book “The Freshwater Mussels of Ohio” authored by by G. Thomas Watters, Michael A. Hoggarth, and David H. Stansbery, a unique gift idea for the Holiday season. In addition to detailed accounts of each mussel species found in Ohio, the book provides information on basic biology, human use, and conservation issues of molluscs. Did you know that a recent scientific estimate puts two-thirds of our freshwater mussels at risk of going extinct? Mussels are important though, they naturally filter the water of our rivers, without them the murky waters would be less livable for other organisms. About the Author: Angelika Nelson is the curator of the Borror Laboratory of Bioacoustics and the social media manager for the Museum of Biological Diversity. All photos taken by the author.